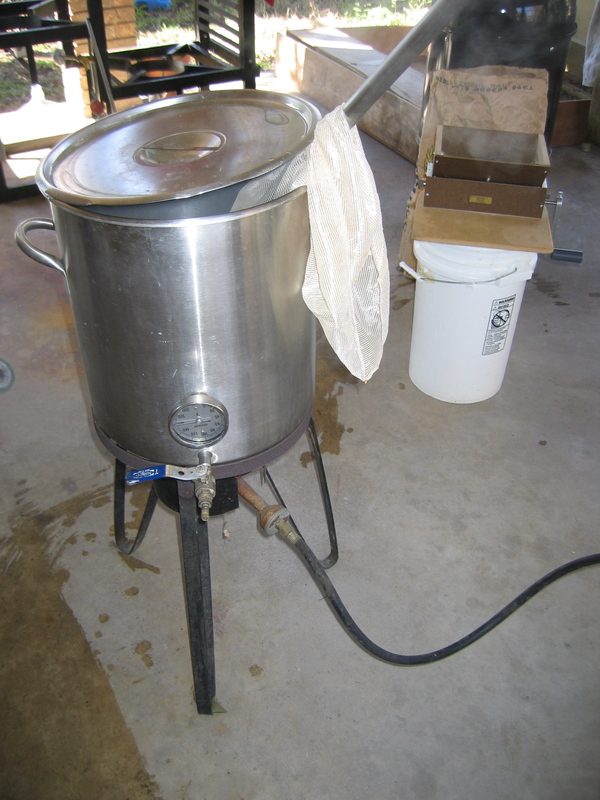 Steaming malt for 30 seconds is an easy way to condition your malt in your home brewery. When a homebrewer crushes his or her malt, he or she must consider two opposing factors when determining how finely to crush. The more finely he crushes, the more the malt endospermwill be broken into small pieces and the better his extract efficiency will be. On the other hand, if the husks are broken into pieces that are too small, lautering may become more difficult and the possibility of extracting too many tannins rises. So, when setting the mill gap, the brewer chooses a compromise setting that gives an acceptable level of extract efficiency without interfering with the ability to lauter. For homebrewers willing to put in a little more effort, there is a way to crush the endosperm more finely, but not break the husks into too many pieces — malt conditioning. In malt conditioning, the husks are moistened just enough to make them slightly leathery and hold together a bit better when they pass through the rollers of a grain mill. Malt conditioning is fairly common in commercial breweries, but it is easy to adapt to a home brewery. If you have the right equipment, the simplest way to condition malt is to steam it. If you have a heatable mash tun with a false bottom, add enough water to fill about half the space under the false bottom and bring it to a hard boil. Place your (uncrushed) grains in a large nylon steeping sack and place the sack in your mash tun. Put the lid loosely on the mash tun, leaving a small gap to let steam escape. After only 30 seconds, pull the bag out and pour them into an empty container, like a brewing bucket. Stir them with your hand and let them sit for about 2 minutes (or long enough so any liquid on the surface of any of the grains gets absorbed). While the husks are still faintly “leathery,” proceed with milling. Don’t let the malt sit for an extended amount of time after steaming it — do this immediately before crushing. To fully take advantage of the mat conditioning, experiment with adjusting your mill gap to find a new compromise between crushing the endosperm and breaking up the husks. 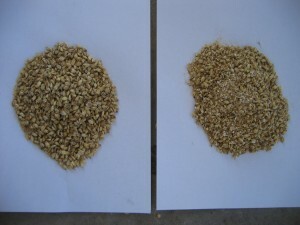 Conditioned malt (left) vs. dry milled malt (right). Note the larger husk size on the conditioned side. This method is simple, presuming you have the equipment, and fast. (The actual steaming part goes by very quickly.) Plus, it is reliable. First of all it uses hot water. Malt takes up hot water (in this case, steam) faster than it does cold water and steaming ensures a reasonably even uptake of water. The grains on the very bottom of the bag may get a little wetter than the rest, but that’s not a problem. And, if you want to ensure a more even conditioning, you can process your malt in small batches, so that the “grain bed” getting steamed is only 3 to 4 inches high. Just steam some of the grain, crush it and go steam the next portion and repeat until all the malt is crushed. In addition, it is hard to overdo it with this method. Other methods for doing this at home exist, for example, see Kai Troister’s method on his webpage. Of course, dry milling works well for most homebrewers. If you are getting results that you consider acceptable from that, going through the added step of malt conditioning may not be worth your time. However, if you’d like to either increase your extract efficiency or routinely experience lautering problems, give malt conditioning a try.